What a wonderful day! 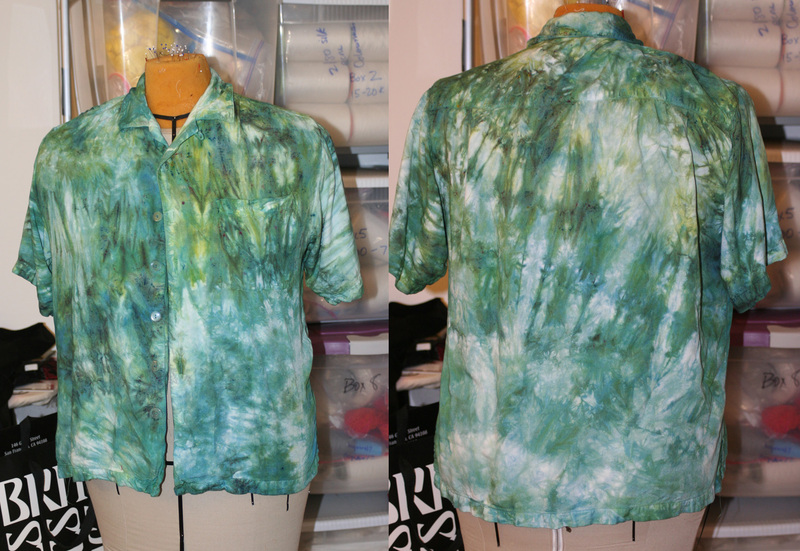 Â I dyed seven shirts, made a big batch of zucchini chips (take that, Audrey II! ), and made three quarts of bread-and-butter pickles from our garden’s cucumbers. Â I’m fond of bread and butter pickles, but the ones sold in supermarkets bear very little resemblance to the “real” ones I make. Â I don’t just put in cucumbers, sugar, vinegar, and mustard seed, as they do commercially, but add sliced onions, red peppers, and an assortment of pickling spices. Â The resulting pickles are deliciously complex and yummy. Â It’ll be hard to keep my hands off them for the two weeks it will take the flavors to “marry”. But enough about food. Â Back to fiber! 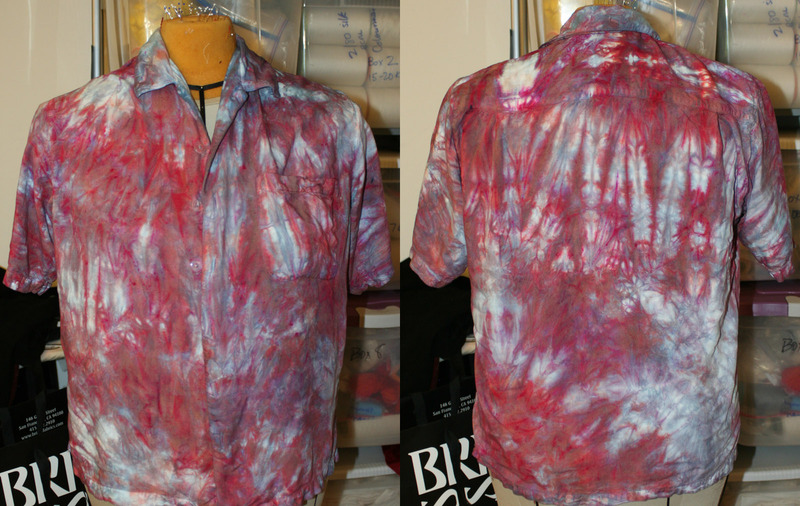 Here are the seven shirts I dyed, which bear pretty much zero resemblance to what I had planned, but some of which came out very nicely indeed! 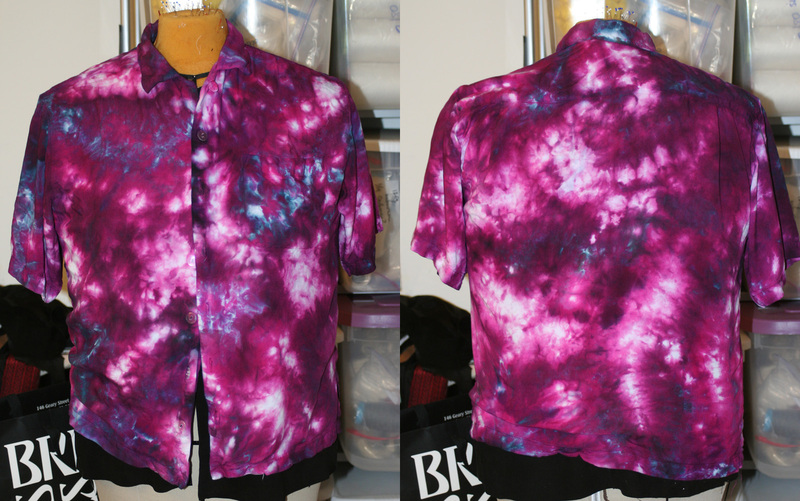 The shirt above was, believe it or not, intended as a mix of golden yellow and Â red-violet, in little spirals. Â As you can see, there are no spirals, and there is precious little gold or violet! Â But it is beautiful. Analysis: I was attempting to dissolve dye in a very strong salt solution (on the recommendation of the book). Â There was so much salt in the solution that the dye particles didn’t dissolve. Â As a result, the golden yellow mostly didn’t “take”, and the fuchsia manifested as little flecks of color that you can see in the closeup. 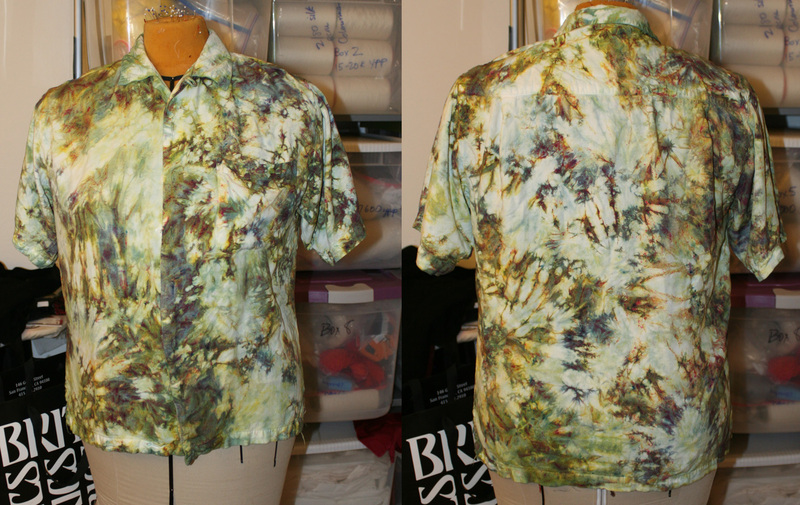 Â So I wound up with mostly cerulean blue and golden yellow mixed together, to give a nice mossy green. Interestingly, I was convinced this would be a complete failure when I was looking at it in the tray. Â Ugly spots of light yellow, a sickly green liquid where it should have been violet or brown, and flecks of undissolved dye – yuck! Â I was totally discombobulated (in a very nice way) to unfold it and discover how beautiful it actually was! 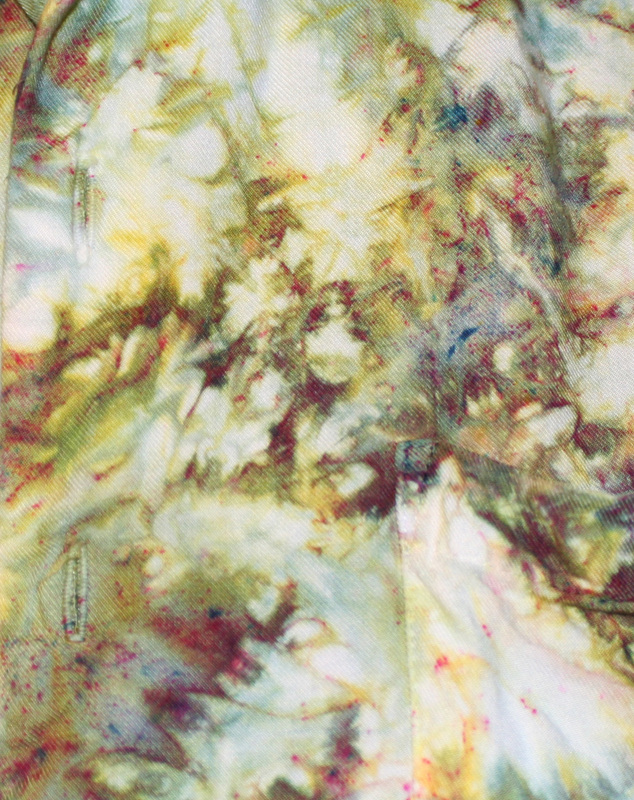 The flecks of color from undissolved dye are called “fire spots” and are generally considered the result of poor dyeing technique. 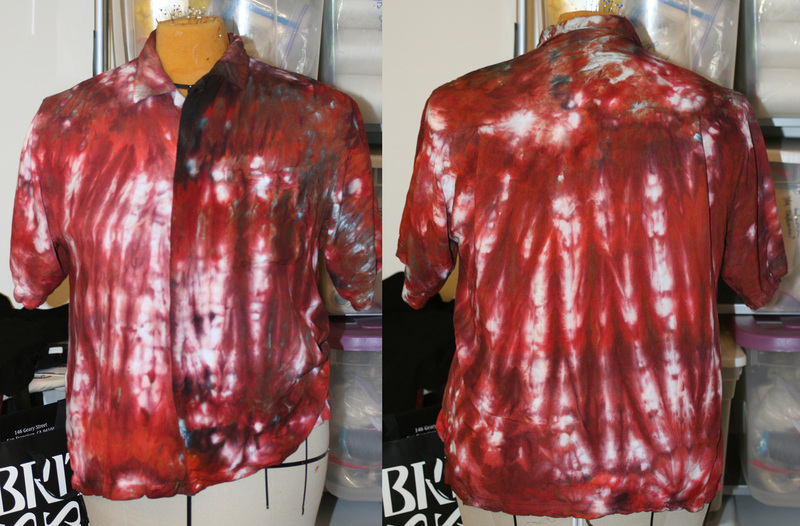 Â However, in this particular context, I think they add wonderful visual texture to the shirt. This one I plan to wear as is! This, believe it or not, was intended as a mix of two blues and a purple. Â What happened? Â I failed to label my colors, and I confused the dark blue with the black. Â The end result? 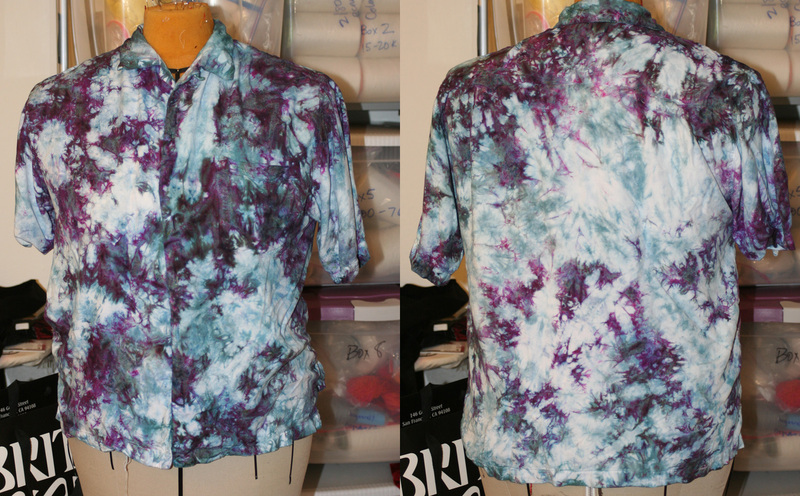 Â A beautiful, serendipitous shirt, with lots of intriguing visual texture. Â I like this one a lot too, and will wear it as-is. The next shirt was intended to be a mottled black shirt, that I would overdye with another color for a stained glass effect. Â But since I accidentally swapped the navy blue and black, what I got was a lovely shirt in complex shades of navy/denim blue. Â I will wear this one as-is. 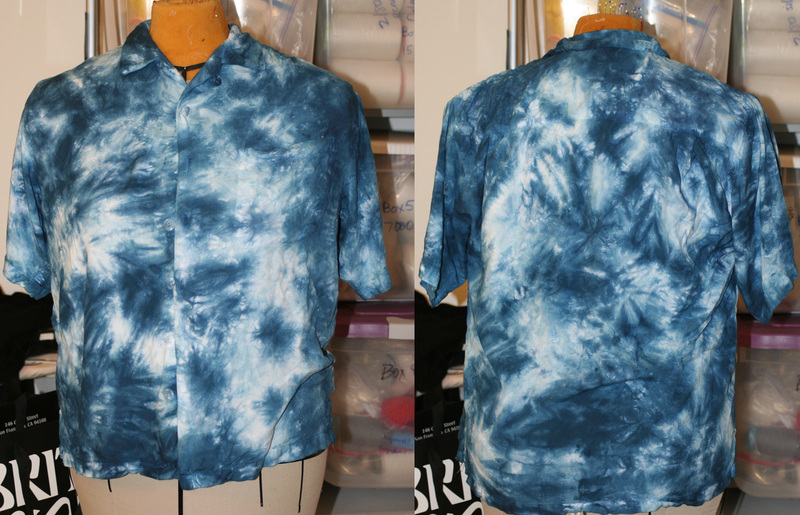 I think I will overdye the shirt above with either turquoise or cerulean blue, then screen print on it in gold fabric paint. Â The blue will tone down the color contrasts, and the gold paint will add highlights. I haven’t figured out what to do with the red and blue shirt. Â I’m half-inclined to overdye with fuchsia – that will cant the colors towards purple, and also tone down the color contrast a bit. Â But fuchsia is definitely too bright to wear into the office. Â Something else entirely? Â Dunno. 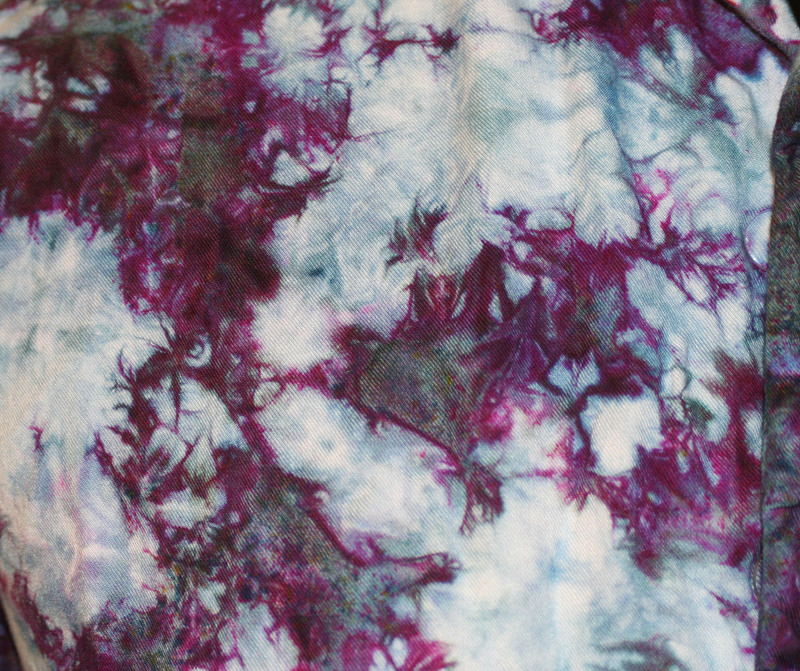 This one I will overdye with a blue, to tone down the fuchsia and bring up the blue highlights. And this one is just begging for re-pleating and more black. Â Tiger stripes! Off to bed! Â Tomorrow I’m back to work on the Celtic Braid Coat, refreshed and relaxed by my “day off”.